I’m always happy to see The Keto Box arrive in the mail, and this month was no different! I’ve yet to be really let down by them, and I’ve enjoyed getting to try out keto snacks and pantry items, many of which have been new to me. 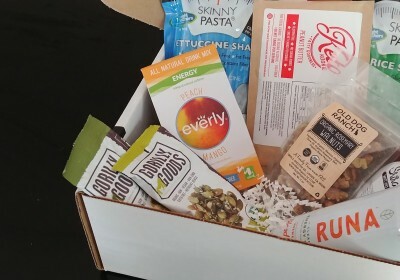 Before we get to what was in this month’s box, a quick refresher: The Keto Box is a monthly subscription that describes itself as a “low carb care package for your body.” For $39.99/month, subscribers receive a box full of 5-8 keto snacks and other products delivered to their doorstep. You can view my reviews of previous months of The Keto Box here. If you haven’t subscribed yet, you will receive a bonus discount of 10% off plus FREE shipping when you use the code THEKETOBOX10. I love Everly drink mixes! I initially discovered them in another keto subscription box, and since then I’ve had three out of the four flavors. Peach Mango is one of my favorites, so I was happy to get some more in these convenient single serve stick packs. Unlike many other drink mixes, Everly is sugar free with 0 net carbs, since it is naturally sweetened with a blend of stevia and erythritol. And speaking of natural, it’s even naturally colored and flavored too! The flavor is nice and fruity without being too sweet, which I appreciate. I also like that Everly uses some of the proceeds from each sale to provide hydration to children in need! We got a second drink in this month’s box! This one was a “clean energy drink” from Runa. I’m not normally not an energy drink person (a cup of coffee gets me going in the morning, and I use a preworkout drink for exercise), but I was actually excited to give this one a try. I like that it used a shorter, more natural ingredient list compared to something like Monster or Red Bull. I drank it on an afternoon when I was feeling a bit sluggish, and it definitely gave me a bit of an energy boost. It’s naturally caffeinated using leaves from the Guayusa plant, which is native to the Amazon where people brew it like tea. The taste is similar to tea, though this variety has an added blood orange flavor and light carbonation. I added a couple drops of liquid sweetener and drank it ice cold. Next up, we got two different varieties of this organic vegan trail mix from Gorilly Goods. These pumpkin seed blends are gluten free and non-GMO in addition to being keto-friendly! The Hillside mix includes kale and a savory spice blend with a tiny bit of heat, while the Baja blend includes hemp seeds and a lime, cilantro, and chili based spice mix. Both were pretty tasty, though I think I liked the Baja flavor a little more. I find that dried kale can have a pretty strong flavor, so the spices in the Hillside blend didn’t shine as much as a result. Yum! I’ve been meaning to try this sauce for ages, so I was super excited to see it in this box. It’s a sweet an spicy sriracha based sauce, made by a fellow ketoer! I immediately tried it on a batch of chicken wings, and it was absolutely delicious. The sweet and heat are very well balanced, which makes it great for chicken as well as other meat based dishes and even stir fried veggies. The pouch format takes a little getting used to, but it actually makes it a bit easier to measure (important, since it does have some carbs and condiments can be easy to overdo). It also makes it take up less space, which is better for shipping and saving room in the fridge. Though I’m always happy to see low carb products get mainstream success and space on grocery store shelves, I’m usually equally excited to find new, smaller brands to support as well. Old Dog Ranch is a family farm based company in California that specializes in organic walnuts and walnut butters. Not all of their products are strictly keto friendly, but these rosemary seasoned walnuts are and they were pretty tasty! Walnuts are usually something that I bake with as opposed to eat as a snack on their own, so this was a nice way to experiment with using them in a different way. In addition to just snacking on them, these in particular were a nice salad addition too. Konjac or “shiritaki” pasta substitutes are one of those things that seems to be hit or miss for a lot of keto-ers. Luckily, I’ve had good experiences with most brands that I’ve tried and this brand ended up being one of the better ones in my opinion. I usually prep konjac pasta with a rinse in water before quickly cooking them in a pan and adding to my dish. Although I’ve never had issues with a “fishy” smell or taste in a final dish after prepping konjac noodles that way, these seem to have the most neutral smell/taste right out of the package compared to others. The texture is a bit closer to something like ramen or udon noodles than traditional pasta, but it’s a passable substitute for those who aren’t satisfied with (or don’t have time for) something like spiralizing veggies. I like them in some healthy bone broth along with meat and veggies! Although I’ve tried various konjac “pastas” as I mentioned, I had actually never tried any of the rice-style varieties because I wasn’t sure how the texture would hold up in that format. Having tried it, I think I’d say it’s much easier to prep than something like cauliflower rice but it doesn’t have quite the same “bite” to it. I think it would be a decent substitute for a meal with rice as one of the ingredients, especially if you aren’t a cauliflower fan, but it probably wouldn’t be convincing as “plain” rice. I’m very intrigued by the possibility of using it for a risotto-like dish though! Lastly, we got these yummy low carb treats from Keto Kookie! I have had their other flavors before (double chocolate is my favorite!) but this peanut butter variety is brand new. The Keto Box subscribers were actually the first to get to try it, since it wasn’t even available to purchase yet! Like the other Keto Kookie varieties, they are made with quality sources of healthy fats like nuts and grassfed butter. To keep things keto they are sweetened with erythritol, one of my favorite sweeteners. I was really a fan of the soft texture and rich peanut butter flavor of these cookies! I really enjoyed the variety that The Keto Box offered this month! We got a couple drinks, some pantry items, a few savory snacks, and of course those yummy cookies. I think this box leaned a bit more towards the pantry side of things than some previous ones, which is a nice way to mix things up. It’s nice to get a few things that can be the basis of a meal (like the Skinny Pasta). I also like getting multiple-use products that will last until the next box arrives, like the Srirachoy sauce. I’ve gotten a few different condiments from The Keto Box, so I feel like I have a lot more flavor options now. Looking at retail values, this is one of the lower valued boxes that I’ve gotten from The Keto Box, but it really didn’t feel like it. I think it’s worth noting that many of these products (like the Keto Kookies and Gorilly Goods) can’t be purchased as single servings at retail, and others (like the Srirachoy and Old Dog Ranch) would incur shipping charges to try just one package. Because of that and the use that I got out of the products this month, September’s The Keto Box felt worth it to me. Want to sign up for next month? 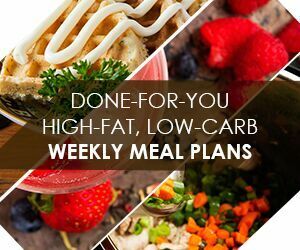 Use the code THEKETOBOX10 to save 10% and get FREE SHIPPING on your order!